transliteration and word for word translation. MAHAVISHNU, the First Purusa. MahaVisnu, in the Causal Ocean, is the creator of the aggregate material energy, and is an expansion of Sankarsana. Karanodakasayi Vishnu creates Mahat Tattva. Visnu is the Supersoul of the collective universes. Causal ocean. MahaVishnu is in charge of several universes like this. Tantrics believe that Mother Goddess has Maya as the womb; the causal ocean resides inside the womb. Brahma sitting on lotus of the stalk is the child of Mother Goddess, the stalk is the umbilical cord; Mother's Sakti produced Narayana (Jagaddhatri) as the preserver of the world. Garbhodakasayi Vishnu (Second Purusa) Supersoul of Total living beings. The creator of Brahma living in the Garbho ocean. Four-handed form. Garbhodakasayi Visnu is an expansion of Pradyumna. Ksirodakasayi Visnu is the Supersoul of all individual living entities including demigods. Associated with Maya. Kasira (milk) ocean. The third purusa, Ksirodakasayi Visnu, is an expansion from Aniruddha. He is of goodness –Savatanu. Also Paramatma = Supreme Atma or Soul. He is all pervasive, even in inanimate objects. It is not uncommon that Krishna is depicted at various levels of hierarchy: Narayana, Ksirodakasayi Vishnu, Garbhodakasayi Vishnu, and Vaikunthanatha. It is explained that Krishna’s Supreme Will makes it possible for him to assume all of the above forms. Krishna is the original, the source of all incarnations. Krishna lives in Svetadvipa in the middle of Milk Ocean in these universes. There are many universes like this. Vrndavana is the worldly counterpart of Svetadvipa, where he spends his pastimes. Lotus born Brahma takes orders from Pradyumna. Brahma has fifty attributes of man plus five more dilute higher attributes that man (Jiva) does not have. Sambhu-Siva: has fifty attributes of man plus five higher attributes of Brahma that man (Jiva) does not have. The following has the details with some variations. What sets the Supreme Person above everybody else? 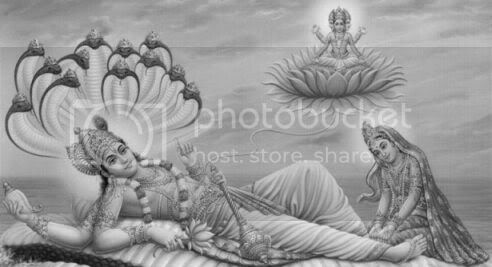 Man, male and female Devatas, Brahma, Siva, Narayana share many qualities. Krishna has qualities that are exclusive to Him. There are a total of 64 qualities of which the first fifty are in unlimited quantity in Bhagavan, and graded quantity in other gods and deities; man has them in limited quantity. Qualities from 51 to 55 are in unlimited quantity in Bhagavan Krishna and are deemed special to Brahma, Siva and other gods and goddesses. Listed between 56 to 60, Narayana has still higher qualities which are not shared by the preceding entities. Qualities listed between 61 to 64 are the exclusive domain of Bhagavan Krishna, the Supreme Person. This is a modified list as depicted in Jaiva Dharma, Chapter 13. Qualities of Bhagavan include all 64 of them. 35) Modesty; 36) Shyness; 37) Saranagata Raksaka- Surrender-protector 38) Happiness; 39) protector of devotees; 40) Controlled by Prema of devotees; 41) Benefactor of all; 42) Tormentor of enemies; 43) Fame; 44) Beloved by all; 45) Partiality to Sadhus; 46) Enchanter of women's mind; 47) Worthy of worship by all; 48) All opulence; 49) Superior to all; 50) The Controller. All these qualities are in unlimited quantity in Bhagavan and in a limited quantity in Jivas, Individual souls. Five qualities are in Brahma, Siva and other Deities. The above 55 qualities are present in lesser amounts in Deities. Lakshmipati Narayana has the following additional exclusive qualities. 60) Enchanter of the ones who attained the Delight of their souls. The following qualities are in the exclusive domain of Sri Krishna not present in anyone other than HIM. 64) The resplendent beauty of His transcendental form is enchanting to all mobiles and immobile forms. Mahavishnu, according to Brahma Samhita, created Vishnu from his left limb, Brahma from his right limb, Sambhu, the manifest divine masculine halo, from glabella between his eyebrows. Sambhu is Siva, the transformed power of Krishna or Mahavishnu delegated to bring destruction. Sambhu, it is said, originated from the diffuse halo of Mahavishnu. Sambhu is compared to curds (yogurt) that originated from milk after contamination (active cultures); Sambhu is svamsa (Vishnu’s own subjective entity, though contaminated) of Mahavishnu. Svamsa = Sva + Amsa = own fragment. Sambhu is a masculine principle from whom Rudra manifests. Sambhu is delegated by Mahavishnu to do certain tasks: material creation of the world, destruction of Asuras, and sublation. Sambhu is the guna avatara of Govinda: destructive principle. Sambhu collaborates with Durga in the performance of his duties with Kaala (Time element). This universe and beings are time-bound under aegis of Deputy Sambhu. 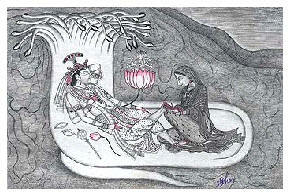 He also helps Jivas attain liberation as mentioned in Tantra sastras. Brahma Samhita declares that Sambhu functions in accordance to Govinda’s Will to inculcate devotion in devotees according to Agamas. Sambhu is the Lord of Jivas. Brahma Samhita says in effect that the Consciousness of Sambhu is not the same Pure Consciousness (Chit Sakti) of Vishnu, Mahavishnu, Govinda or Krishna; however, Sambhu’s consciousness is superior to Jiva’s consciousness (We the people). Vishnu, though his guna avatara is Sambhu, is chock-full of Sattva; he has no contamination with mundane tattvas or categories. The lower forms or derivatives of Govinda or Krishna are analogous to transmittable light from one candle to the next, all abiding in the original spiritual light of Govinda. Siva, as a purveyor of Tamas guna and ignorance, is chock-full of soot and less of light; thus, he is not Pure Consciousness as are the forms of Mahavishnu. Brahma spews more soot in his candle than Sambhu and thus, Siva-Sambhu is superior to Brahma. The differentiating five attributes are purer in Siva-Sambhu than in Brahma, meaning that Siva-Sambhu is more divine than Brahma. Goddess Durga, according to Brahma Samhita, is the maid servant of Karanarnavasayi Vishnu and performs her delegated work in conjunction with Siva Sambhu. Govinda is the final shelter of all including Brahma, Vishnu and Siva. Govinda/Krishna--->Vishnu, the controller of Maya. Krishna is endowed with Aisvarya (opulence) and Madhurya (sweetness). Krishna is the fountainhead of Rasa (Sap, Essence); He is Rasa Himself. Sri Narayana, Brahma and Siva operate at material modes of Sattva, Rajas and Tamas. Sri Krishna/Govinda→Sri Narayana→ Mahavishnu (First Purusha→ Second Purusha→ Third Purusha). These are the linear elements, the latter expanding from the former. Govinda is like the Original Great Flame from which the secondary flame of Sri Narayana, and the other linear elements are derived in a linear manner. Mahavishnu is Govinda's / Narayana's Avatara; but there is no difference between them. Karanarnavasayi Vishnu (Karana-arnava = Causal ocean) is a fragment of the fragment of Govinda. Karanodakasayi Vishnu uses Maya to create and is the Supersoul of all universes. Causal ocean is where he abides. Zillion unlimited universes are present in the hair pores of His body. When He exhales, universes emerge; with inhalation, myriad universes enter Him. Sesa being the servant of Sri Krishna, becomes His bed; Mahavishnu enjoys Yogamaya. MAya Devi Durga is Karanodakasayi Vishnu's potency. Karanarnavasayi Vishnu (Maha Vishnu) (Karana-arnava-vasayi = Causal-ocean-living). From his hair pores originate objective Brahma, Vishnu, and Siva who live for the duration of one exhalation of MahaVishnu. (Guna Avatars = descent of Avatar with qualities.) They are called objective because their functions such as creation, maintenance, and destruction are objective and quantified. Garbhodakasayi Vishnu (Second Purusa) Supersoul of Total living beings is the expansion of Maha-Vishnu, the creator of Brahma living in the Garbho (womb) ocean. Four-handed form with a lotus stem sprouting from his navel. Brahma is born in the lotus flower. Garbhodakasayi Visnu, is an expansion of Pradyumna. He is all-pervasive, living in the hearts and atoms of the universe. Garbhodakasayi is commonly known as Brahma, the womb of the universe. Supreme Mahavishnu is in charge of countless universes like ours. One Brahma and one Siva are assigned to one universe. They all enter into Mahavishnu upon his inhalation. They are alive for the duration of one breath of Mahavishnu, who is a portion of a portion of Sri Govinda's plenary portion. --Sri Brahma Samhita Verse 48. Verse 14: explanation: In simple terms, Maha-Vishnu makes many copies (facsimilies) of Himself and one copy here known as Vishnu enters one of the zillion universes; Upon his entry He assumes the name of Garbhodakasayi (Womb) Vishnu. Ksirodakasayi Visnu, the expansion of Garbhodakasayi Vishnu, is the Supersoul of all individual living entities including demigods. Associated with Maya, He is the maintainer of the universe. He abides in Ksira (milk) ocean. The third purusa, Ksirodakasayi Visnu, is an expansion from Aniruddha. He is of goodness –Savatanu. Ksirodakasayi Vishnu: Immanent God lives in Milk Ocean and is the supersoul living in every being. Ganesa, the creator and destroyer of obstacles, derives his power from Govinda. Brahma Samhita takes a less complicated view of the constituents of the world as opposed to Sankhya and Tattvas of Saiva Siddhanta. The three worlds, composed of ether, air, fire, water, earth, direction, Time, soul, and mind, take their origin from Govinda, exist on his body and enter him at sublation. The nine elements cover all elements depicted in Sankhya and Tantric systems. 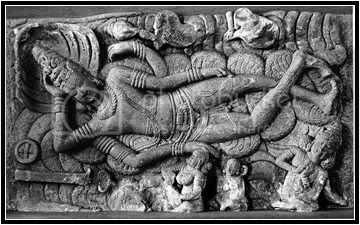 Once Destruction is complete, Vishnu takes Yoganidra (Yogic Sleep with awareness) on Serpent bed. He is then called Sesasaayi Vishnu. Padma Purana says (part 10, C8, V43b-45) When the Lord is in Yoga Nidra (sleep), the entire earth was immersed in gazillion amount of water. Incarnation of Krishna is endowed with aggregate powers of Vishnu and Krishna expansions. Vishnu expansions as listed above. Krishna expansions: Narayana, (the foursome) Vasudeva, Sankarsana, Pradyumna and Aniruddha. Partial expansion such as Matsya, plus yuga avatars and Manvantara avatar. All powers of objects and beings emanate from Govinda and remain in them in a limited fashion, for those powers can never exceed those of Govinda. All virtues, vices, vicissitudes, Vedas, penances and Jivas from Brahma to an insect exist because of Govinda. Govinda doles out karmic consequences to all impartially according to the weight of karma; it is not any less for Indragopa insect than for Indra, the king of Devas (gods). He incinerates the fruitive activities of his Bhaktas (devotees) root and branch, so they can attain Mukti (liberation). Bhakti obtains a higher status and currency with Krishna/Govinda than in the Tantric system, where it is number two in the bottom: Kriya, Bhakti, Jnana, Dakshina, Vama, Siddhanta, and Kaula paths. For the four fold paths of Saiva Siddhanta (Chariya, Kriya, Sukha, and Sanmarga Margas), go to Siva-Ashtamurthy. Go to Tantra Three Tirumantiram for details on the sevenfold path of Tantrics. Krodha (anger), Kama (passion), Sahaja Pranaya (natural love or friendship), Bhiti (fear), Vatsalaya (वत्सलय = வாச்சல்லியம் vāccalliyam = n. < vātsalya. Tenderness; parental affection), Moha (delusion), Guru Gaurava (reverence to Guru), Sevya Bhavaih (proneness to service), Sancintya (meditation) are the feelings entertained towards the Lord; all these feelings liberate the soul but the road to liberation is different for each one of them. They assume the bodily appearance to go with their Bhava (nature and feeling). They wear their feelings on their face and body they are born with. The Vatsalya class of devotees gains body and feelings of nurturing parent. The passionate receives body and feelings of a Gopi (milkmaid); the devoted get body and feelings like those of Narada Muni; he who fears God gets body and feelings like those of Kamsa. The Gopis attained liberation (moksa) by love, Kamsa by fear, Sisupala by hatred, Pandavas by friendship, Yadhavas by attachment, Narada by devotion. The key is thinking and remembering the Lord in love, fear, hatred, friendship, attachment, devotion or any one of myriad feelings. The Lord seems to say, "Ignore me at your own peril."